Today I will talk some more about combinations. The fixed blade on the pictures today is an absolute wonderful full-tang construction from Sweden. More correct Lapland in Sweden. It is the Casström number 10 Swedish forest knife. The steel is O2 carbon steel and it still got the factory grease/oil on the blade. Carbon steel need to be wiped or cleaned after use and get some mineral oil on it. 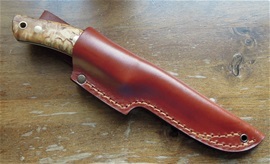 This knife is the one with Masur birch handle. From what I have heard these knives are made in Sweden and other European countries. The blade design I know is a popular bushcraft style in Great Britain. The design of the handle is very interesting. I have not used this knife, I have heard good things for sure anyhow. I was very curious on the handle. Ergonomics is an interest of mine and the fit is perfect and every part rounded. The Wenger New Ranger on the picture I know practically everything about. It is used, tested in any way I know how. 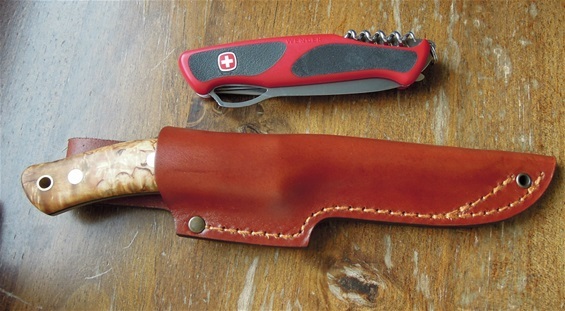 The combination of the Casström and Wenger SAK is “très bon”. Carbon steel got some advantages on wood and for Bushcraft tasks. This all depends on the user. The Casström knife is a high quality fixed blade knife. The Wenger New Ranger saw is a formidable one and just imagine all the batoning and cutting one would have to do to compete with this saw. It is a known fact that two knife blades, a wood saw and a fixed blade knife represents a philosophy with the outdoors. To have some versatile functions for tasks on equipment brings higher odds. Today a plier used on multi-tools represents a tool for the outdoors and survival tasks. No plier on the New Ranger on the picture. Wenger understood the importance of this and implemented pliers on the 130mm category. Today used on the Victorinox Ranger knives. There are different ways to baton and this is my point as well. Why the combination a wood saw and a fixed blade knife? It is simple if you split some wood with your fixed blade knife you baton. Batoning is also when you need to cut a branch or part of a tree. This is the danger part with fixed blade knives. It can put so much strain on the blade and edge that you damage it. Then the wood saw is best. That is why a combination works well. When you baton you use a piece of wood and hit the top of the blade. Do not use a hammer! Read the wood before you baton. Splitting wood is best with a fixed blade knife. The fixed blade can never replace an axe. That said for some light wood splitting and bushcraft tasks it will perform well. Some wood is easily split but all this depends on the type and how it has grown. 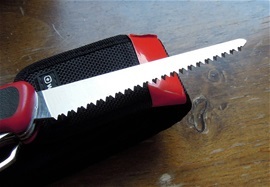 A wood saw will relieve a blade because you can rather effortless cut a branch or a smaller tree. If you would use the fixed blade knife you would have to baton. This is risky like I said. Also for hygiene two separate knife blades is a good choice. In the outdoors it is about having a blade sharp and ready all the time. How you carry the blades is important. Correct knife use is about using as little force on the tools as possible. This is many times forgotten today. Stress and knife use does not work together. You must think before acting and make a plan. The advantages with carbon steel and stainless all depends on the user. On SAKs it must be stainless. If you would take two similar fixed blade knives with one carbon and one stainless there could be some advantages going back and forth. You can experience differences in edge holding abilities, sharpening and other factors. Carbon steel and Stainless steel are very different with the hardening process. The quality you get depends on the maker. O2 is a very good but demanding carbon steel. With impact then carbon steels got some advantages. On meat the stainless edge may perform better. Everything depending on type of steel and how it has been processed + user. In my experience stainless got the biggest advantages with ability to prevent corrosion and for hygiene. Without repeating too much this depends on user with a smile. Stainless steels are very demanding for the correct hardening temperatures. This must be correct. When it comes to the testing of the knife from Lapland then you can find information about this on the internet. This one I know is a very good knife and I was mainly just interested in the handle. It is a very special design and everything well done. 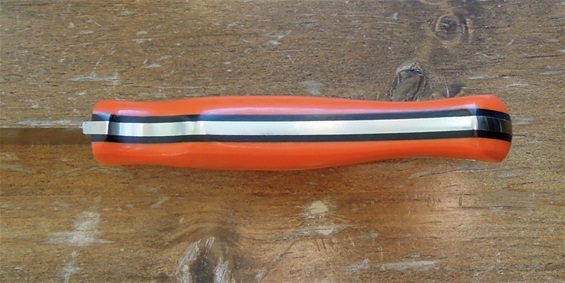 It is a complete handle design and it goes in the collection. It is a nice example to be used in combination with SAKs and multi-tools. So Casström, Helle, Karesuando, Brusletto or other is your choice. There are lots of wonderful products in today’s market. This should mean without arresting me that it is a type of alloy carbon steel. This means that one must use some oil on it because it can rust. I know it is a good carbon steel. I remember a question about what oil that is the best. From what I know mineral oil or medicinal white oil that it is also called is the best. I am always open for suggestions on this! Let me know. I learned that this is a type of oil that works ok for protecting the steel and it will not be dangerous for food tasks. It is always smart to wipe it before food tasks. I know some clean the blade as well. I learned from experts that in the outdoors this is important teachings. From experience I will tell some interesting details that I discovered myself. I have used SAKs, Multi-tools and fixed blade knives in the outdoors. When fishing and cleaning fish it is unavoidable that the blade gets dirty. The blade usually gets much saltwater on it. Some fresh water in a bottle can be very smart to have and to rinse the blade and wipe it before put in the sheath. Carbon steel, tool steels and stainless steel blades must all be cleaned after use in the saltwater and on fish. I use some soap and warm water to clean the blade. On Carbon steel/tool steels I use some mineral medicinal grade oil. It cost almost nothing. Stainless steel got advantages around saltwater but it is not maintenance free anyhow. On SAKs and multi-tools it must be stainless components or else it will be a mess in time. I have learned to have good routines with cleaning my SAKs and multi-tools. This i do for safety and especially in a fishing kayak. I learned from the old knife makers of traditional makers that the blades must be wiped after use always. Carbon steel developed a patina and this I have experienced myself and I watched this with great interest. The steel develops a patina and the blade gets darker. This is in many cases a positive development and it prevents corrosion if the patina is well developed. Some do not like this patina and use polishing substances or other to keep the blade shiny all the time. 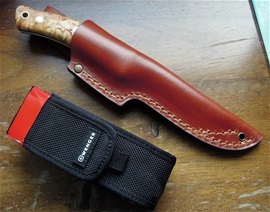 The leather sheath for the Casström knife is very well made and it is a secure carry. On Swiss Army Knives i always use the Victorinox Multi-Tool oil. I use it on Multi-tools and fixed blade knives. It is a bit small bottles to be used on fixed blade knives and that is why I started to use some Mineral medicinal oil on them. This oil is far too thin for use on SAKs. The Victorinox oil is the best oil in the world in my opinion. It got a thicker consistency and better locates itself at the friction parts. If you have input you would like to share on knives just let me know. I like to learn! Ok lets do some more knife talk! This is one of my favorite subjects and it is about combinations and Scandinavian edge. The blade on the Casström is almost 4mm thick (3,8mm) with a Scandinavian edge. This I have learned is the best edge for fixed blade knives and it makes the tip section very strong. Having two blades can be valuable to have and the blade used on the Wenger new Ranger is large enough to be an outdoors blade for absolute everything by itself. The combination wood saw and blade is incredible. A fixed blade knife that can do some harder tasks and or be clean all the time is of valuable help. I would hesitate to not having two large blades. The New Ranger Blade got one hand opening and locking mechanisms. This construction has been tested well. I have used it as a safety knife in my kayak on the life-vest belt in a pouch. In my experience I learned that this was actually safer than a fixed blade. I will explain why. The Wenger New Ranger was easily reachable from the pouch, it could be opened with one hand and it was easy to release the blade in again. A sheath knife is too long and clumsy. The Ranger blade and the fixed blades I used was about the same blade length. It was not easy to reach it on the side and to put it back in the sheath again. I learned that in a kayak fishing the Wenger knife beat anything else. The slim blade is very useful. I do not like to carry a sheath knife around the neck in a kayak. It is difficult to see and I do not want to cut myself. Folding knives with OH and locking mechanism is perfect there. Casström has left the edges on the back of the blade sharp for fire steel. Every part of the handle is fit perfect and rounded like I said earlier. The only thing that could be negative is the lanyard hole that is a bit sharp. This could cut the cords in time. This can easily be rounded oneself. A lanyard must be present around water all the time! Write it in stone folks. There are some that wonder how oiled masur birch and leather takes saltwater environments? The answer to this is easy and if you follow maintenance guides by the makers it will last a very long time. I noticed that hunters that dress animals have sheath knives with wood and leather that lasts a long time. Traditional materials stand the tests of time. I have a small challenge to you as well. Will O2 steel develop the same patina as regular carbon steel? I would like to know. Cr or Chrome is one of the elements used in stainless steel to achieve corrosion resistance. On K720 the Cr is low and it will rust without maintenance. It will tarnish as they say. Let me know! The Casström number 10 Swedish forest knife have a total weight 252 grams and knife alone is 183 grams. By using the new Ranger knife in my kayak as a safety knife I discovered that it was perfect for safety and I started using it on the fish when inside to kill it. This was the fastest and safest way for me without a doubt. It must have been a funny view for the people that could see me when I started fishing from fishing kayak some years ago. It was not easy at first but a lovely feeling when I started to master it. I hunt and study Polypores and some of them are hard as wood. A good fixed blade and the Wenger saw works perfectly in combination. The slim Wenger blade cuts with high precision. I will explain some about my thoughts and forgive me if i write strange or difficult. Ergonomics=comfort=safety. These are the three most important factors that complete the design. I am a big fan of the Norwegian Tollekniv that is a traditional handle used here. It got a barrel shape almost or a small trout body section. This handle has taken all tests of time over 1000 years I like to believe. This handle locks in the hand and can be used in any grip direction or position. It locks in the palm of the hand secure. This shape is actually so well developed that is can be polished with a fine surface without slipping. It is designed so well that even with blood and remains from fish it is not slipping in the hand. The “tollekniv” handle is in other words a perfected one. The Casström handle is very special and it is on a full-tang construction. This handle got all the factors involved. I cannot see that this design hurting the three most important factors. It is comfortable in many positions and it locks. It is very comfortable. Nothing beats the tollekniv handle with traditional design. But this full tang handle design is very intelligent and well done for a full tang knife. It brought further knowledge for me. I am not completely sure who is the designer yet and from what country? I have seen some looking similar before but not completely. This handle is complete and I cannot find any negative in this design. The lanyard hole I mentioned is no problem for the hand. I would also like if you would take the time to see what I have written about rescue knives and ergonomic on sakhome.com. To complete the talk today i will mention some about the Scandinavian edge. In my opinion the true Scandinavian edge is with one angle. It should be completely flat at the complete edge section. As said before you can find information and tests on the steel and edge on the internet. On my knife it is flat and that is Scandinavian edge to me. I noticed on the webpage that the words written in Swedish suggested a convex edge. This is sometimes mentioned as Scandinavian edge too. On the webpage on English it says flat Scandinavian edge. On my knife it is flat with no secondary edge either. Remember that when you sharpen a flat Scandinavian edge this got some advantages. That said it depends on how you sharpen the knife to be able to continue this flat edge. It will always be a small section of the very sharpest part of the edge that is not fully flat and it will in some cases look like micro secondary edge. A small sharpening stone will in most cases make a convex edge in time no matter what. Many say that such sharpening is only maintenance and correct sharpening must be done on a machine. In some sense this is correct. If you use large sharpening stones you will be able to maintain the flat edge longer. I can add some that on the webpage in swedish it says “konisk” it means conical and that is usually without convex. It is so that when konisk is mentioned people may hesitate. That said people misunderstand this. There is always a micro secondary edge on a flat Scandinavian edge because the last part of the sharpening involves a sharper angle. This we do when sharpening by hand as well. That said I can mention that this last part of the sharpening can be done my machines in a factory and the micro part may have a more micro convex line. Sharpening by hand is demanding for any grind or edge geometry. The angle and results….. I can see that the Swedish forest knife is available with a full flat grind blade too. This is a completely different grind and edge. It is not as strong but it will cut more precise and cut better in some materials. It any case it is a weaker blade and edge. It will be sharper. The Scandinavian edge is the best and it will be a sturdy blade for bushcraft. It got lots of material behind the edge that is good. I have to show you this knife that I have just received. The full flat grind makes this a blade that cannot be used for batoning with force. This is also a blade that can be used in combination with SAKs. It is absolutely beautiful! The fit and finish is outstanding and the orange G10 just looks amazing. Orange color fit perfect in the outdoors just like the orange Wenger AP Blaze does. This is a stainless steel blade that can be used for a lot of different cutting tasks and this edge is very sharp. The lanyard hole is also rounded inside so it will not damage the cords. I cannot find any negative on this knife. It is a full tang knife with ergonomics and comfort. It is a Complete handle.